Filed to: gronklings!Filed to: gronklings! Gronk has not yet been cleared to play for the Patriots on Sunday, but once he is good to go, he's got a group of fans eager to see him back in uniform. 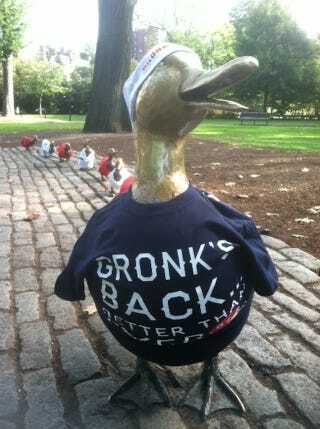 Nancy Schön's famous Make Way For Ducklings sculpture at Boston Common has been transformed into Gronk's big little welcoming party. Say hi to the Gronklings, everyone!